Having six cats in the house makes having a good cat litter a very important consideration. 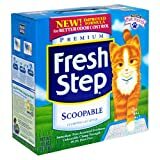 Fresh Step scoopable cat litter is one of my favorites. I prefer scoopable litter because it makes keeping the litter box clean so much easier. And I also prefer unscented litter because I don’t like exposing my cats to heavy scents and perfumes. 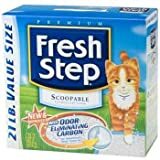 Fresh Step scoopable cat litter works well on both of these fronts for me and my cats. There is both a scented and an unscented version. I use the unscented version exclusively. While the scented version may be pleasant for pet owners, I worry that my cats may object to the scent and start avoiding the box. I’ve seen that happen so many times in my veterinary practice and I don’t want to risk it with my cats. So while the scented litter may work for some cat owners, I prefer to avoid it. I like that Fresh Step gives me that option. 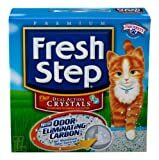 Fresh Step scoopable cat litter forms nice solid clumps fairly quickly. The clumps don’t tend to break apart when I attempt to remove them as happens with some of the other scoopable cat litters that I have tried over the years. That makes litter box upkeep much simpler. 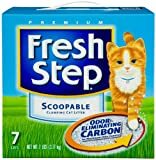 I also use Fresh Step scoopable litter in my automatic litter boxes where it is important that the clumps form quickly enough that they do not break apart by the time that the rake activates to sweep the box clean. Fresh Step works well for this purpose also. When I fill the litter boxes with fresh litter, I do notice some dust with Fresh Step. However, the amount is not intolerable and it tends to settle very quickly. It does not seem to cause a problem for me or for my cats. 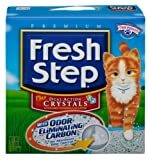 Fresh Step does seem to control odor well and I notice no litter box odor in my home as long as I keep up with my litter box duties regularly. That also is an important consideration and another reason I like Fresh Step. Unbeatable odor control. (Based on lab tests with cat urine.) Immediate paw-activated freshness. Unbeatable clump strength. 99.9% dust-free. Fresh Step Premium Cat Litter Offers Unbeatable Odor Control, in Three Ways: 1. Its highly absorbent, quick clumping formula lets you easily scoop out the source of odors to keep your litter box fresh. 2. Its fresheners are activated right when your cat scratches or steps for immediate odor control and a light, fresh scent. 3. Its patented odor neutralizers control odor between uses so you can rest assured that the litter is always working. Sold by weight not by volume. Contents may settle during shipping. 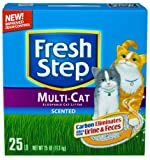 Made in U.S.A.
Fresh Step Scoopable premium cat litter offers the same paw-activated odor control of Fresh Step Clay, plus unbeatable clumping strength. 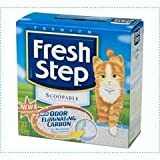 Fresh Step Scoopable helps you keep your home smelling clean and fresh. 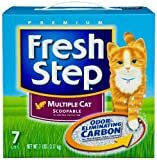 Fresh Step Scoopable 7 lb litter contains odor-eliminating carbon for a litter box so fresh, it’s almost like not having one at all. 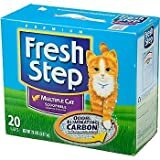 Find more Fresh Step Scoopable Cat Litter products on Amazon!